Yorkville, New York— A mesmerizing stand of Handpainted Green Tall Pine Tree silhouettes highlight the Tall Pines Vanity Light from Meyda Custom Lighting. Just one of many nature inspired vanity luminaires from Meyda Custom Lighting, a leading manufacturer and designer of versatile decorative lighting. 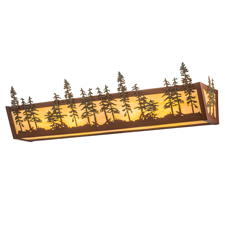 The Tall Pines Vanity Light (model 185635) is a linear luminaire with a stunning woodland design and matching frame in an authentic Rust finish. Beautiful ambient light emanates from the stunning Botticino Idalight diffuser. This fixture can be used as a striking vanity light in a fine bath or used as a wall sconce in any room in a residential, hospitality or commercial setting. The Tall Pines fixture is custom crafted by highly skilled artisans in the Meyda manufacturing facility in Yorkville, New York, at the foothills of the Adirondack Mountains. A nearly infinite array of vanity lights are available including other appealing designs featuring Moose, Bear, Ducks, Deer, Mission, Wine Bottles and more. Custom styles, sizes and finishes are available, as well as dimmable energy efficient lamping options. The 30 inch wide fixture is UL and cUL listed for dry and damp locations. Meyda Custom Lighting is a Meyda Tiffany Company, a leading manufacturer and designer of custom and decorative lighting and Tiffany lamps. Founded in 1974, the firm’s roots date back to the early 1900s supplying Tiffany Studios with original lighting products, including the original Coca-Cola stained glass fixtures. With many years of designing, engineering and manufacturing expertise, Meyda develops innovations, technologies and value that transcend architectural lighting for any budget or economy. The firm’s diverse talent creates chandeliers, pendants, wall sconces, table and floor lamps, outdoor lighting and stained glass windows, to meet your exact specifications. Meyda Custom Lighting is headquartered at 55 Oriskany Boulevard in Yorkville, New York. For more information, Tel. 1.800.222.4009. Website: www.meyda.com. Email: Sales@meyda.com.